Scarlet-red petals that are edged with a golden band. A perfect choice for cut flowers. Mid season flowering, 50 cm tall. Darwin Hybrid tulips produce large showy flowers which can measure up to 7cm in diameter. These tulips are known for their tall height and sturdy stems. This allows the tulips to perform well in all climates. Due to these two attractive qualities, Darwin Hybrid tulips are a popular choice for cut flowers. 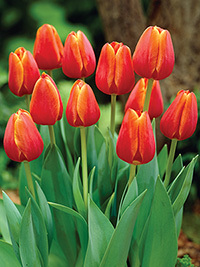 These tulips are also great perennial tulips and will come back for several years. Just ensure that the leaves turn yellow before cutting them back.